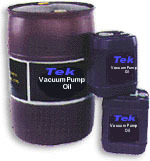 Tek-SV is a synthetic vacuum pump fluid for use in all vane and vmost piston pumps. This synthenic fluid is has a high chemical resistance and lasts 4 to 5 times longer than conventional vacuum pump fluids. In laboratory studies we have seen mechanical vacuum pump operating temperatures lower, oil changes less frequent and service life of pumps extended. 55 gallon. Weight 435 lbs.